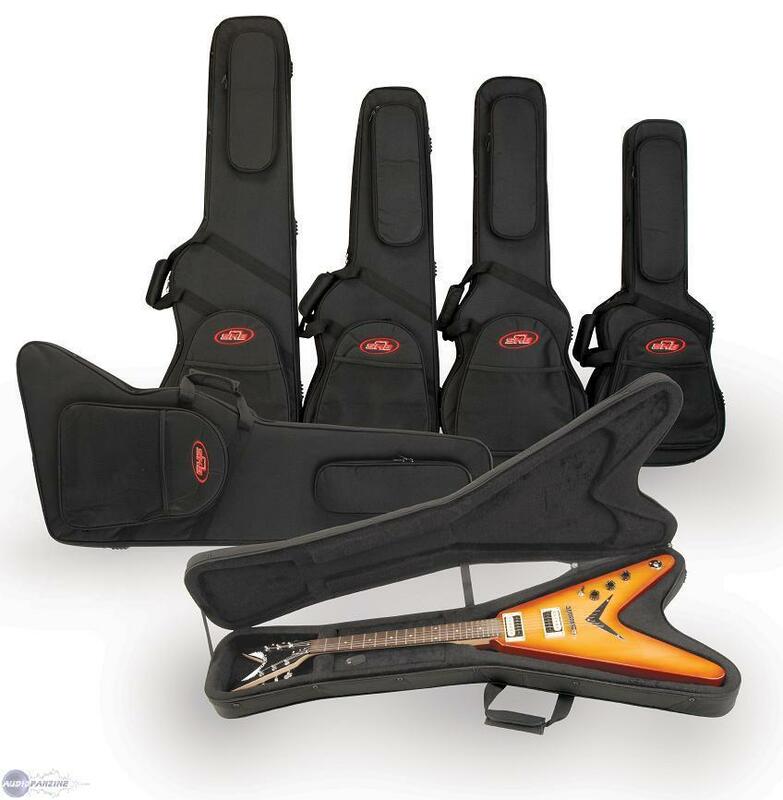 1SKB-SC58 Flying V Guitar Soft Case, Guitar Case/Bag from SKB. SKB Corporation expands its popular Softcase line with six new models for acoustic and electric guitars as well as electric basses. According to SKB, these new cases offer the protection of the same rigid foam found in the brand’s hardshell cases with the style and portability of nylon gig bags. The 6 new models include the two newest case designs from SKB, the 1SKB-SC58 for Flying V® Type Guitars and the 1SKB-SC63 for Explorer®/Firebird® Type Guitars. 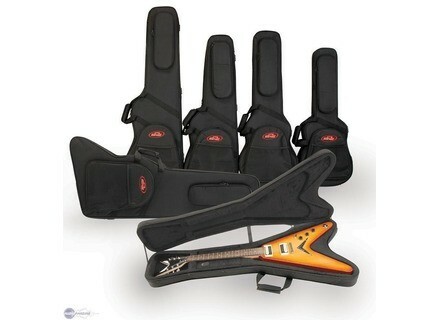 Unlike conventional, rectangular shaped guitar cases, these Softcases employ distinctive designs (both interior and exterior) that mirror the actual shape of these unique instruments, yielding a smaller footprint while cradling the guitars for added protection. The other four models are the 1SKB-SC300 for Baby Taylor/Martin LX; 1SKB-SCFS6 for Universal Shaped Electric Guitars; 1SKB-SC56 for Les Paul Type Guitars; and 1SKB-SCFB4 for Universal Shaped Electric Basses. SKB claims that these softcase models are manufactured of a rugged, weather resistant 600 Denier ballistic nylon exterior with a hard-core EPS foam interior to provide more substantial protection than a conventional gig bag. The plush lined interiors also aims at offering full neck support for added protection over a conventional gig bag. All Softcase models include two external zippered pouches, one with numerous internal compartments for organized accessory storage, as well as adjustable padded backpack straps for easy transport. Gadow Guitars Vintage Hand Wound Pickup Gadow Guitars has announced that they are now hand-winding their own pickups and will soon offer them as the only pickup for their instruments.